Why are we talking about a personal organization system? Well, I was lucky to have a mentor early in my career who was incredibly organized. I would constantly wonder how she remembered the tiniest of details from meetings that happened months ago. Everyone wanted to work with her because they knew they could rely on her. As I grew in my career, I knew this was the type of project manager I wanted to be. Reliable, detail-oriented, and constantly surprising people with how much information I can keep in my brain. It turns out, the secret is not to rely on your brain at all. When you’re balancing multiple projects, clients, and teams, you can find yourself constantly bombarded with incoming everything. This includes emails, Slack notifications, calendar reminders, or just a “quick question” as you pass a coworker on your way out of the office. Being organized is all about how you handle all of those ad hoc tasks, requests, conversations, alerts (etc) every day, so you can look at your work and know that you’re working strategically in the activities that move you towards your goals. How do you stay organized at work? You need to develop your personal organization system. Let’s get this out of the way. There are some great tools such as productivity apps and time management software that can help you organize your tasks and time, but tools are not systems. Google Calendar is a great tool for managing your schedule, but how you use it will dictate how effective it is. How you use it is your system. Think of it this way: even if you have all the tools in your kitchen to host the perfect dinner party, if you don’t strategically plan how you’ll use each tool, you’re going to have some hungry guests. Key takeaway: A personal organization system is a set of rules you create for yourself to handle the many inputs you’ll have to deal with in your life. This is a powerful but simple-to-use app for creating to-do lists. 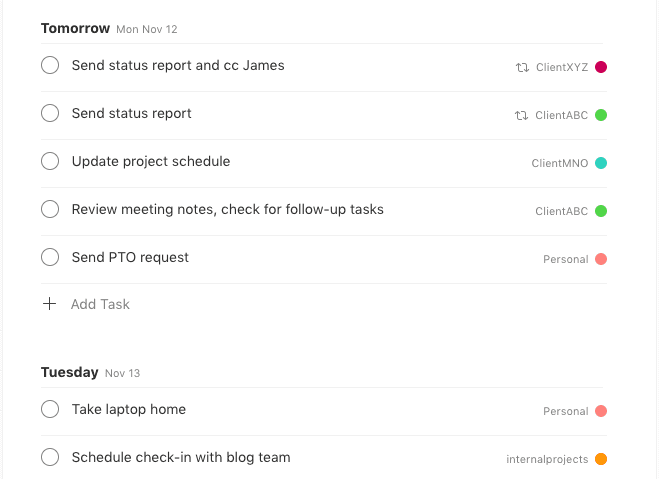 You can categorize list items into projects, assign priority levels, and set recurring to-dos. I like to describe this as an “accountability tool” because it helps you hold others accountable for replying to emails. You can create custom settings for each email you send so that if (for example) nobody responds within 2 days, the email will pop back to the top of your inbox. This tool requires no introduction, but it’s worth mentioning because, although simple, when used well it’s one of the most powerful organizational tools in your arsenal. A big part of my organizational system is figuring out how and when I would like to receive Google Calendar alerts. This personal organization tool is designed to help users create productive work habits by minimizing distractions and maintaining focus through time-blocking. It’s based off of the pomodoro technique (a time-boxing technique). You can use this to help structure your work cycles, track and analyze your work time. Taskful is a productivity tool similar to Todoist. The nice thing about this to-do list tool is that it lets you create sub-tasks for achieving bigger tasks, and there’s a simple progress bar showing how close the task is to completion. This app also has an intuitive design and straightforward features that are really easy to navigate, even for new users. Toggl is a time-tracking tool with a really beautiful, streamlined design. You can use it to track the time you spend on each task and categorize your time with labels and projects. If you’re not sure where your time is going throughout the day, using a free time tracking tool like Toggl can help you get a realistic look at how you’re spending your days. IFTTT (“if this, then that”) is an app you can use to sync activities between your other apps and across devices. I include this in this list of personal organization tools because it can help you automate a lot of the little organizational tasks you might do throughout the day, such as backing up files, entering data in spreadsheets, and hundreds of other tasks. It takes bit of time to figure out the best way to use it, but once you’ve found the automated flows that work for you, it can save a lot of time and free up your mental cycles for bigger thoughts. Sometimes when you have back-to-back meetings, you don’t have time to translate your meeting notes into action items. It can start to feel like the classic image of Lucy and Ethel as they desperately try to keep up with a non-stop line of candies. Except instead of delicious chocolate, you’re dealing with a conveyor-belt full of time-sensitive requests. When this happens, take 5 seconds to remind yourself to go back through your notes later. This is just one rule that works well for me, but you’ll need to create your own set of rules to determine how and when you use each tool in your project management toolkit. 1. Make a list of your inputs. 2. Ask: How much warning do you need to address these on time? Let’s say you want to remember to send a budget update to your client. You need to send it on Wednesday morning, but you also need at least 30 minutes to put that budget report together, and you need to make sure the account owner has signed off on it before you send it to the client. Setting your reminder for Wednesday morning is simply too late, so you’ll need to set up a reminder Tuesday afternoon to finish the report and send it to your account owner. Then you’ll need a second reminder for Wednesday morning to make sure it’s been approved, and then send it off. Do not rely on Google Calendar to automatically set reminders for you. When I’m boarding a flight, I’ll often get an (automatically generated) calendar notification for my flight. I find it hilarious. If you relied on nothing but Google Calendar to remember your upcoming flight, you’d miss it every time. 3. Determine the level of alert or reminder you’ll need. Do you need an air horn or a gentle nudge? Some items on your to-do list are more time sensitive than others. Your reminder to leave on time for a client meeting should be much more disruptive than your reminder to request PTO for next month. For gentle nudges, I like to set recurring reminders in Todoist. I’ll see the action item in my inbox, and I’ll know it’s something I have to do at some point today. Another good option is to use Boomerang or the Slack “remind me” feature. You have the option to keep snoozing your reminder until you actually have time to address it. For truly time-sensitive items, you’ll want to make sure you see the alert no matter what you’re doing. Make sure you’ll see these reminders on your computer and your phone. When I have something I really can’t miss, I’ll set an alarm clock on my phone as a redundant backup to my Google Calendar alert. 4. Set aside regular time to get organized. The best way to make sure you actually use your personal organization system to is block out time for it. I like to be one of the first people in the office. It’s quiet and there are no meetings, so it’s the perfect time to orient myself for the day. If that’s not an option for you, put organizational time on your calendar. Block the time out, or it probably won’t happen. Depending on the calendar system you use in your organization, you can simply set the time to “busy” so nobody tries to schedule over this time. Better yet, label this time in a more conspicuous way. It sets a great example for your team to see that you take time to get your life in order. PMs are human, after all. Obviously, many of us want to be more organized because we know it can help us be more productive at work. But there are other, more subtle benefits to having a solid personal organization system: every time your organization system works, you’re making a good impression. Your peers, employees, clients, and boss are all learning to trust you. Likewise, knowing that the people you work with are organized helps you trust them. Nobody likes working with someone the can’t rely on. Whenever I’ve supervised an entry-level employee, I’ve adopted this policy: I don’t care what your system is, as long as it works. Even if you don’t have direct reports, you can make an impact on your entire organization through leading by example. The next time someone gives you an action item, try responding with something like: “Got it. I’ll set myself a reminder to do that on Thursday morning and follow up with you then.” By giving a detailed response, you’re showing them you have a plan to handle it, and it tells them when they can expect to hear from you. Not only do you increase their trust in you, but you strengthen your trust in yourself as you consistently follow through on your commitments. What’s in your personal organization system? What tricks, tips, or tools do you use to stay organized? Comment and share below. I’m a digital project manager at Fuzzy Math, a Chicago-based UX design firm. I began my career at a startup incubator, which exposed me to a variety of different fields including e-commerce, manufacturing, and printing. My project management experience is on both the client and agency sides. I love creating processes from the ground-up and helping teams perform at their very best.